Mr. Bloom has been with the firm since 1995, following a judicial clerkship with Honorable Robert Longhi, then-Assignment Judge in Middlesex County. He handles high exposure general liability defense matters including catastrophic injury and wrongful death, arising in the context of automobile, construction site, and fall down accidents, as well as public entity liability. He has a particular expertise in the area of contractual indemnification and additional insured issues, and successfully defended and prosecuted such claims in matters involving million dollar exposure. Mr. Bloom has tried over fifty jury trials to verdict and has secured numerous outstanding verdicts such as a recent no cause on damages in a zero threshold, motor vehicle accident case in which a twenty-three year old plaintiff underwent a two-level lumbar fusion; the plaintiff’s last demand was $350,000, and the last offer was $150,000. Similarly, he secured a nominal $10,000 verdict in a rear-end hit case in which the thirty-two year old plaintiff underwent a lumbar fusion with an outstanding demand of $300,000 and an offer of $150,000. In another matter recent matter, he obtained a no cause on liability in a car accident case in which the plaintiff alleged cervical and lumbar herniations, and underwent six fusion procedures, one resulting in a paralyzed vocal cord; plaintiff’s demand at trial was $1,000,000, against an offer of $125,000. He has been Certified Civil Trial Attorney since 2003, and has been selected as a Super Lawyer by NJ Monthly Magazine each year from 2009 to the present. Mr. Bloom has lectured on numerous subjects including contractual indemnification, additional insured coverage, depositions, material misrepresentation in the investigation of an insurance claim, and public entity liability. Mr. Bloom has participated as a judge in the Union County Mock Trial Competition. 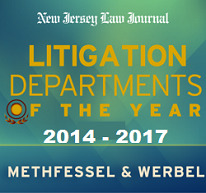 He manages Methfessel & Werbel’s South Jersey Liability Defense Team. Mr. Bloom has also chaired M&W’s Hiring Committee.